Joey Cape delivered a stripped down acoustic set when he serenaded the West End Cultural Centre with some of his tunes last night (September 22). 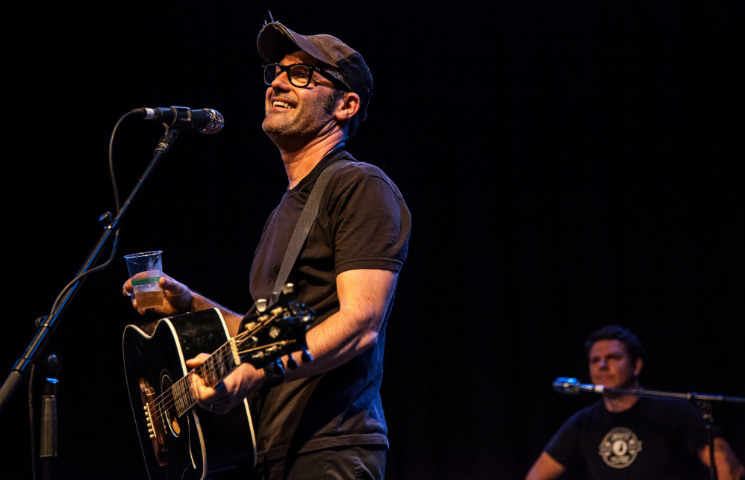 Cape treated the audience to a mix of tracks from his side bands, cuts from his solo records and, of course, acoustic versions of Lagwagon tunes, which really got the crowd going. While Cape packed in a decent number of people into the West End Cultural Centre for a Tuesday, Lagwagon typically draws a larger crowd, so it wasn't totally surprising that the crowd was loudly singing along when Cape launched into "Violins" for the encore, even if it wasn't nearly as energetic as the full band version. Beginning with a Scorpios tune called "Lifer," with fellow Scorpio Brian Wahlstrom accompanying him on backing vocals and keyboards, Cape started off his set strong but simple. He dedicated one of the brand new tracks from his latest solo record Stitch Puppy ("Moral Compass") to all the kids whose parents brought them to the show, but that was the extent of his stage banter; Cape mostly let the songs do the talking. It wasn't overly exciting, but the tunes did sound amazing and the West End Cultural Centre is a venue that knows how to make acoustic guitars sound excellent. As the set wore on, opener Walt Hamburger joined him onstage to play some backing instruments and Cape even ended up playing a Hamburger song called "Three Tattoos." The guys also paid tribute to the late Tony Sly by performing No Use for a Name's "International You Day," which was a nice gesture that was warmly received by the crowd. Near the end, K.J. Jansen made a guest appearance by shaking some shakers and looking totally wasted while doing so during "To All My Friends," the opening track on a record Cape released with Jon Snodgrass called Liverbirds. Jansen's own opening acoustic set was really short, but really energetic. He tried to get the crowd pumped up and singing along, something he didn't really truly manage to accomplish until the end when he played "Miso Ramen." The last time his Calgary-based band Chixdiggit! played Winnipeg was all the way back in 2000, so it was nice to hear songs such as "I Remember You" and "Chupacabras," even if it was only bare bones versions. Hamburger is a Wisconsin native who Cape decided to sign to his One Week Records label when he was on tour last year. He wasn't as entertaining as Jansen, but he sure can whistle, and played a bunch of songs that he says were about drinking and divorce. He also dedicated a cover of Jeremy Messersmith's "A Girl, A Boy and a Graveyard" to his cat Lucy and mentioned that he was taking donations for animal shelters in his home state, which was actually pretty awesome of him.